1995 The 1995 Roush Mustang was one of the first years of this special edition although the parts could be added to the 1994 Mustang as well. From 1995 through 1997 the Roush performance parts were added by dealers and third parties. In 1997, Roush started to perform the upgrades themselves. In 1995, the Roush came in three levels: the mostly cosmetic Stage 1, the Stage 2 with handling performance upgrades, and the Stage 3 with engine power upgrades. There was also a ported aluminum Ford GT40 heads option for the Stage 3. Prices were listed as $3,185 for the Stage 1 (air dam, wing, skirts, valance panel, 17 inch wheels, graphics), +$2,105 for the Stage 2 (springs, shocks, antiroll bars, exhaust), and +$2,783 for the Stage 3 (94hp upgrade (309hp total) to the 5.0L V8, bolt-on intake manifold, cowl induction hood). Each stage required purchase of the lower ones. 1996 The 1996 Roush Mustang came in three levels: the appearance modified Stage 1, the handling improved Stage 2, and the engine upgraded Stage 3. 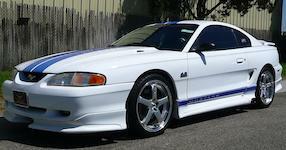 The 1996 Roush Mustang parts came from Roush Performance but installed by qualified dealers and third parties. There was also an optional Ford GT40 header upgrade available for the Stage 3. 1997 The 1997 Roush Mustang continued its tradition of offering the primarily appearance upgraded Stage 1; the appearance and handling improved Stage 2; and the appearance, handling, and engine upgraded Stage 3. In 1997 Roush Performance started to perform the modifications themselves rather than only dealers and authorized third parties. 1998 The 1998 Roush Mustang was the last of the first generation of Roush Performance modified Mustangs. Models included the appearance Stage 1, the handling improved Stage 2, and the engine upgraded Stage 3. 1999 1999 was the first year the second generation of Roush packages installed by Roush Performance. The Stage 1 and Stage 2 packages were offered, each with side exhaust 150mph speedometer on a fully optioned Mustang GT. Stage 2 included performance suspension upgrades. A Stage 3 package offered engine performance upgrades. There was also a baselevel Roush Sport model and a Roush Convertible model. 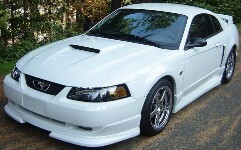 2000 The 2000 Roush continued the modified Mustangs tradition with the same 3 option levels as the previous. The Roush Stage 1 included Roush unique body panels, emblems, side exhaust, wheels, leather seats, and gauges. The Roush Stage 2 added performance handling in the form of performance shocks, springs, control arms, sway bars, and pinion snubber. The Roush Stage 3 added a supercharger. 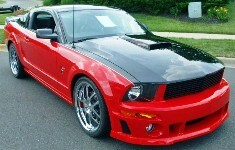 2001 The 2001 Roush Mustang comes in three levels up featured upgrades: the Stage 1, Stage 2 and Stage 3. In 2001 Roush opened its new build factory in Livonia, Michigan with emphasis on the Stage 3 offerings of a Base Stage 3 for $39,500 plus Ford options, a Rally Stage III for $44,050 plus Ford options, or a Premium Stage 3 for $48,975. 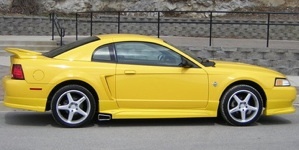 2002 The 2002 Roush Mustang had three model levels. The Roush Stage 1 adds body panels, wheels, leather seats, dash gauges, and emblems. The Roush Stage 2 further adds performance handling. And the Roush Stage 3 completes the set with a supercharger. 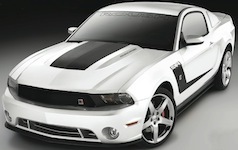 There is also a Roush 360R which is a 360hp version of the Cobra Mustang. 2003 The 2003 Roush came in the appearance packed Stage 1, the appearance and handling Stage 2, and the complete and supercharged Stage 3. There was also a 380hp, 380R based on a supercharged Cobra Mustang. 2004 The 2004 Roush Mustang came in three levels of builds: the Stage 1, Stage 2 and Stage 3. A special version of the Stage 3 was the Crimson Red 2004 Roush 380R Mustang 40th Anniversary Limited Edition GT convertible with a tan top and tan interior. Under the hood is a supercharged 4.6 liter SOHC with intercooler that pumps out 379hp at 5250 rpm and 380ft-lbs of torque at 3000rpm. 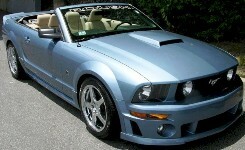 2005 Roush Performance Products offered both performance parts and turn-key Mustang conversions. They had the Stage 1, Stage 2, and Stage 3 turn-key models for 2005. Stage 1 for just an appearance package. Stage 2 adds a suspension upgrade. Stage 3 added performance - a supercharger! 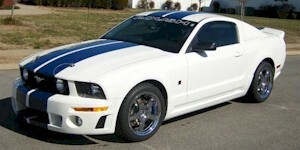 2006 Roush Performance Products offered both performance parts and turn-key Mustang conversions. Three upgrade packages are the Stage 1, Stage 2, and Stage 3. The Stage 3 offers 415hp and 385 lb-ft of torque in its intercooled ROUSHcharged and tuned 4.6L, 3-valve V8 engine. Also offered is the seven piece body kit, suspension upgrades, 18 inch wheels, custom leather interior, and Roush gauges just to name a few. 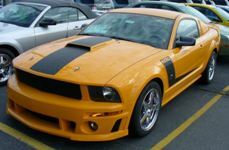 2008 The 2008 Mustang Roush has several upgrade levels starting with hood scoop, spoiler, wheels, and badging in the V6 offering; to the Sport, Stage 1, Stage 2, and Stage 3 which adds upgrades all the way up to a 7 piece body kit and a 4.6L Roushcharged V8. 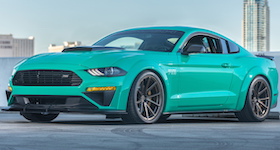 Two popular special edition models are the 427-R and 428-R models which adds a 4 piece custom body, panels, graphics, wheels, interior, accents, and the 4.6L Roushcharged V8 engine. The 428-R engine starts with the Mustang H-code 300hp, 320ft-lb torque, 4.6L, V8: and adds a chrome powder coated Roushcharger; Billet radiator, oil, intercooler, and strut tower cap; and a performance exhaust system to raise the horsepower to 435 and 400 lb-ft of torque. Other Limited edition models include the 510hp P51A, the sporty Speedster, a racing suspension 427R Trak-Pak, and the midnight black only Stage 3 BlackJack. 2009 The 2009 Roush Mustang comes in several carry-over upgrade packages and at least one new Roush Touring Coupe (RTC) limited special edition. Returning in 2009 is the Stage 3, 429R, Stage 3 Black Jack Limited Edition Mustang, and Stage 3 P-51A and Stage 3 P-51B 510hp limited edition. 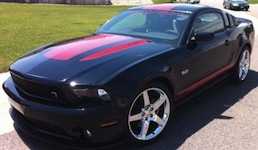 2010 The 2010 Roush Mustang continues to be offered as several performance upgrade packages. One is the 427R which include Roush Front fascia with driving lamps, front chin splitter, side rocker splitters, rear valance, rear decklid spoiler, fender badges and rear decklid emblem, front windshield banner, and 427R striping kit. Additional options include: Roush exhaust, quarter window louvers, interior upgraded seats with suede, 20 inch cast chrome wheels and tire upgrade, short throw shifter with white knob, and illuminated door sill plates. 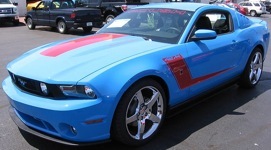 2011 The 2011 Roush Mustang comes in several performance and options package levels. The Roush Sport includes the aerodynamic body kit, splitters, spoilers, billet grille, and graphics. Stage 1 adds performance wheels, tires, more graphics. Stage 2 adds upgraded handling. The RX5 adds a R2300 Roushcharger allowing the 5.0 liter V8 to put out 525 horsepower. 2012 In 2012 Roush has a whole line-up of special upgrade packages and performance components for the Mustang. Vehicle lineup includes the Stage 1, Stage 2, Stage 3, and Stage 3 Hyper Series. The Stage 1 includes the front and rear body panels, interior upgrades, and Roush badges. Stage 2 adds performance handling, wheels, and tires. Stage 3 adds a 540hp supercharger, exhaust, added handling, and graphics. The Hyper Series which comes in black adds custom color accents to their four models called: "Mat It Mango", "Gas It Green", "Punch It Purple", and "Launch It Lemon". 2013 The 2013 Roush Mustang came in three models: the mostly appearance Stage 1; the appearance and improved handling Stage 2; and the appearance, improved handling, and supercharged Stage 3. 2017 The 2017 Roush Mustang is available in the ever increasing modifications in appearance and handling for the Stage 1, Stage 2, and Stage 3. Other models for 2017 include the Roush RS based on a 300hp 3.7L V6, and the Roush P-51 powered by a 727-horsepower Roush Eaton TVS supercharged “Coyote” 5.0L V8 engine. 2018 The 2018 Roush Mustang comes in three main models: the 310hp Stage 1, 460hp Stage 2, and the all powerful 710hp Stage 3. Handling is improved throughout and tons of exterior and interior Roush upgrades including wheels, body panels and trim, interior seating and trim, sound systems, and graphic packages. There is also a Roush 729 wide-body which features a 729hp Roush supercharger.